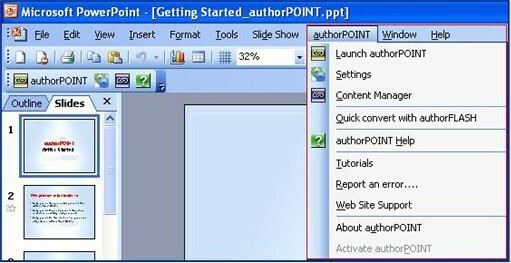 authorPOINT is a PowerPoint to Flash converter for SCORM and ADA compliant Flash presentations, which installs in PowerPoint as a plugin for easy PowerPoint capture and PPT to Flash conversion for SCORM LMS. - Add your own video to the captured presentation. - Convert to Flash, Windows media and Real media Formats. - Includes a Content Manager to manage presentations. The Content Manager has information about each presentation and can be used to distribute presentations. E-learning presentations can be managed easily through the content manager. - Use to create SCORM web based lectures for online distance learning. These lectures can be posted to LMS (learning management system) servers. - Can be used as a rapid e-learning tool to create PowerPoint based training modules with audio and video. As an example, specialists can create web based training (WBT and CBT) to deliver training sessions in multimedia formats. - Capture live seminars with audio and video, convert them to Flash presentations, and upload to your website for easy access to members. E.g. Medical and Law (CME, CLE) seminars can be captured and can be made available over the Internet. - Use as a business enhancement tool to create business presentations. Use these rich media presentations to explain your product/service offerings. Access, or deliver product presentations to prospects online or through storage media. Multimedia presentations, with video are a very effective way of promoting your business offerings.